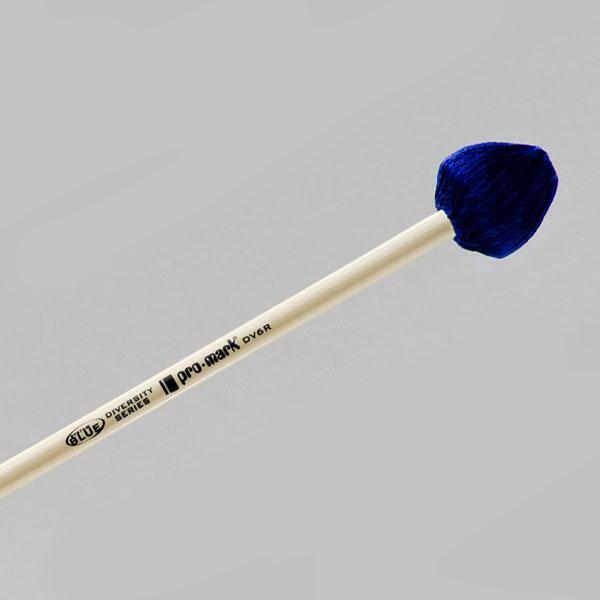 The mallets in the Diversity Series were designed by the Blue Devils' percussion staff to cater to a variety of players by featuring graduated vibraphone mallets and graduated marimba mallets designed for use on synthetic marimbas as well as rosewood. This line is perfect for indoor or outdoor ensembles seeking clarity, articulation, and a mallet than can hold up to any musical demand while still maintaining a true, fundamental tone from the keyboard. The DV1 mallet is a perfect choice for playing low notes on extended-range marimbas. The mallet features a latex-wrapped rubber head, nylon-wool blend yarn, and 15" birch shaft. Length: 16 3/8"
The DV2 mallet is a great low to mid range keyboard mallet. The mallet has a latex- wrapped rubber head with a nylon-wool blend yarn tightly wrapped around. Length: 16 1/2"
The DV3 mallet speaks well in the mid to high range of the marimba, and has a great attack and articulation, characteristic of this series of mallets. 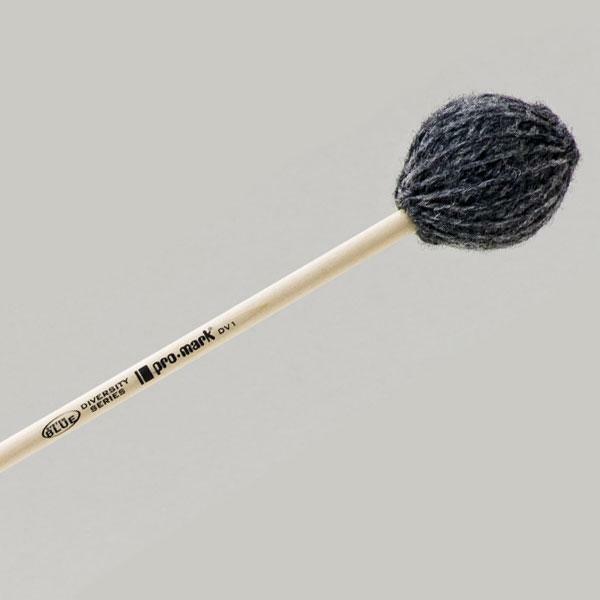 The mallet has a latex- wrapped rubber head with a nylon-wool blend yarn tightly wrapped around. It is the optimal Diversity Series mallet to buy for general use! Length: 16 1/2"
The DV4 mallet is a perfect choice for a crisp and clear attack in the high register during articulate or colorful passages. The mallet has a latex-wrapped synthetic head with a nylon- wool blend yarn tightly wrapped around. Length: 16 1/2"
The DV5R mallet is the softest of Diversity Series vibe mallets. It features a latex-covered, mushroom-shaped rubber core and brass weight wrapped tightly with cord on a 14.5" rattan shaft. This mallet provides a glossy vibe tone with little attack. Length: 16"
The DV6R features a mushroom shaped rubber core and brass weight wrapped tightly with cord on a 14.5" rattan shaft. This mallet enables the performer to play a large range of dynamics while retaining a smooth tone. Length: 16"
The DV7R is the most diverse of the Diversity Series vibraphone mallets. It features a mushroom shaped rubber core and brass weight wrapped tightly with cord on a 14.5" rattan shaft. This mallet offers the player enough variety to “belt” out notes when needed and be able to immediately drop down to perform more delicate passages. Length: 16"
The DV8R features a mushroom shaped rubber core and brass weight wrapped tightly with cord on a 14.5" rattan shaft. A player using these mallets can punch out notes in front of the ensemble while preserving quality and integrity with the instrument. Length: 16"